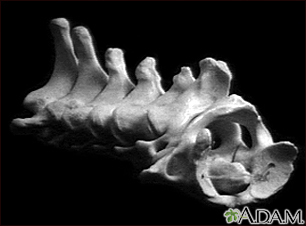 These are the seven bones of the neck, called the cervical vertebra. The top bone, seen on the right of this picture, is called the atlas, and is where the head attaches to the neck. The second bone is called the axis, upon which the head and atlas rotate. The vertebra are numbered from one to seven from the atlas down, and are referred to as C1, C2, C3, etc.